We had nice weather all weekend and our irises and day lilies are starting to peek through the ground. I had a lot to do to finish preparations for my week as Guest Designer at Everyday Cricut - there are bits and pieces of projects everywhere! We took some time Sunday afternoon to attend a tea for members at the Fruitlands Museum in Harvard, MA. 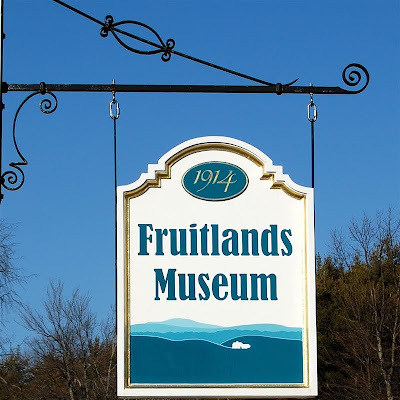 This is a fascinating museum on the site of the utopian community experiment that Bronson Alcott (father of Louisa May Alcott who wrote Little Women) and Charles Lane attempted in 1843. The Alcott family lived there only seven months before they were forced to abandon the attempt at living on the "fruit of the land" when winter came and they were poorly prepared. 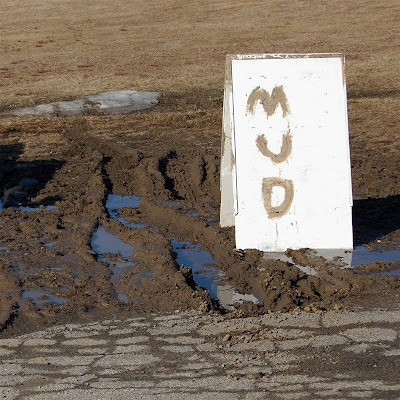 It is "mud" season here in New England - as officially declared by this sign! 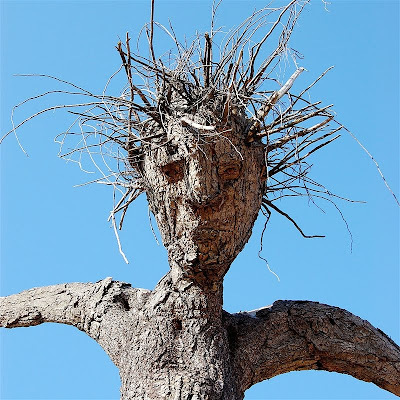 There is an incredible exhibit of Tree Figures on the grounds. These sculptures were created by Joseph Wheelwright. 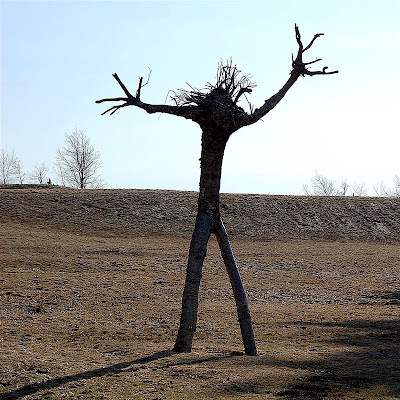 They are formed from trees with a natural division of the trunk, pulled up and turned upside down so the two sections become legs. The roots now at the top become the heads and arms. Sometimes he adds pieces to create a certain position for the figure. 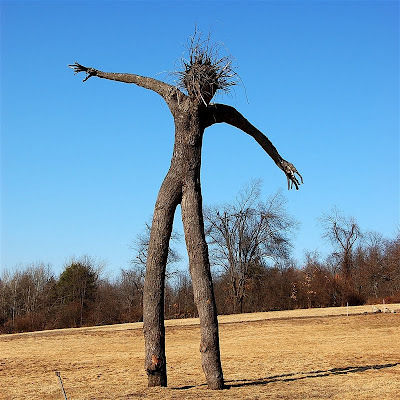 They tree figures are enormous and very powerful. 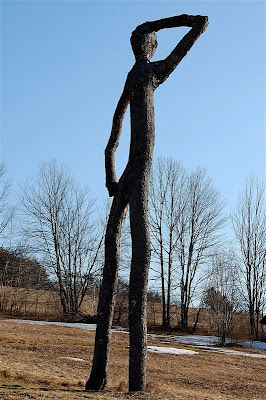 Here is a closer view of one of the "faces" This LINK will take you to the page on the Fruitlands site where you can find out more about this art. I am always interested to see what inspires people to create art. I don't think I would have envisioned an upside down tree as a person! It is amazing how different people can look at the same basic materials or natural objects and imagine something completely different. 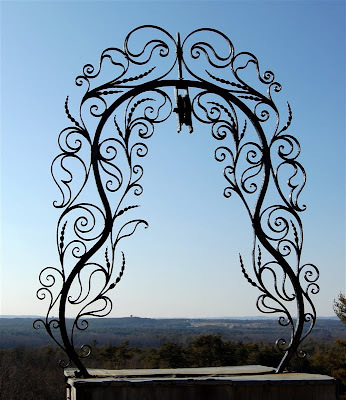 I did see this ornate well on the grounds and it gave me an idea for a border or frame. I always have a camera with me - you never know when you will see something that inspires you! I hope you will be visiting the Everyday Cricut blog on Monday - it is the "simple card" day and I have a card and video to share. There will also be more information and another video on my blog so you will be doing a lot of hopping back and forth this week if you follow the series! I am not very creative but I have always been amazed at the creativity of others and how there minds work to come up with their ideas. Those trees are amazing. Thanks for sharing.